Ice as far as the eye beholds. Impossibly beautiful, blue skies. Incredibly fresh air. Musk oxen and arctic foxes on the stark landscape of the arctic tundra. Yes, we are in one of the most remote corners of the world: Greenland. Feel the soft crunch of snow beneath your shoes while running through the arctic desert and Greenland ice cap and immerse yourself in this rare and exceptional natural beauty... what more could we ask for? This will undoubtedly be the coolest experience of your life. A part of the route takes place on the ice sheet itself, but the main part of the course is run on the gravel road (often snow covered) that connects the ice sheet with the small township of Kangerlussuaq, just north of the Polar Circle. Everything you need to know should be right here. If there is something specific you are looking for that you can’t find, feel free to write us with your question. Please note that all decisions made by the race officials and or medical team are final and not up for discussion. Albatros Adventure Marathons reserve the right to change the itinerary and/or running course without further notice in the event of extreme weather. This also includes the decision to cut the course short. By signing up for this event you agree to the Terms & Conditions of Albatros Adventure Marathons. There are no specific requirements for clothing, but the medical team and race officials do have the right to stop and take out a runner who’s not dressed properly for the weather, so we strongly advise that all participants follow the below recommendations and make sure it’s possible to cover all skin. Layers are key to a good race and used to keep you as dry and warm as possible and to be prepared for changing weather. It is always better to start out in a layer too much than one too little. Remember: it is easy to cool off if too warm, but hard to get warm if too cold. How many layers you wear is an individual matter and weather depending, but a minimum of 3 layers is recommended. There are personal supply stations along the course where you can pick up dry and warm clothing – see “Supplies on route". Wet and cold items can be dropped at any water station along the course. We do not give specific recommendations on products, but have named some of the brands available in active polar clothing that we know have a good and well-tested product. Must be a functional thinner layer that transports sweat away from your body (called moisture-wicking) and dries fast. Make sure it’s comfortable to wear and doesn’t restrict you in your movements. Avoid base layers with zippers that touch the skin. Should be a loose weave fabric or fleece with additional thermal insulation thicker than your base layer. Again it’s important that it doesn’t restrict your movements, especially with the outer layer on top. The mid layer should provide warmth and breathability. Again it’s important that moisture is transported to the outside/next layer. Some mid layers even have wind protection, but this is not a must as you won’t be running without your top layer when windy. The top layer can be divided into two categories: Soft shell and hard shell. Regardless of what you’ll choose wind protection is the most important thing. Water resistance is a plus too in case it snows. While soft shells are now being manufactured with better wind and water resistancy they’re still not as efficient as a hard shell. The hard shell on the other hand, does not have the same breathability as the soft shell, although development of vent zones does allow for more airflow and thus minimize the risk of wet and cold mid- and base layers. In extreme wind conditions starting in both a soft and a hard shell can be advisable, but it is also very likely that you will soon be too warm and will need to drop one of them. Remember: Cotton is your worst enemy when running in an arctic climate. It is a rough material, which can rub your skin raw. Plus, you'll freeze! Do not wear cotton clothing during the Polar Circle Marathon and Half Marathon. Instead, high-performance clothing will decrease your chances of getting blisters and calluses. Three layers on your legs are likely to be too much. The top layer on your legs must have wind protection and preferably thermal functionality. A base layer under a winter tight will work if the tight has wind protection. Alternatively a normal winter running tight may work fine as base layer under a pair of windproof running pants. Running without wind protection on your legs may cause frostbite on knees, thighs and other lower body parts. Again, wind protection is the most essential, but of course your gloves should be warm too! Make sure your gloves aren’t too tight around your hands and fingers – it’s better for airflow between your skin and the fabric. Layers will be an advantage in very windy conditions with inner gloves, under a warmer and looser pair of outer gloves or mittens. Hand warmers are an option, but as we try to leave as little a footprint as possible on our race site we recommend the reusable solutions over the disposable versions. Extra gloves can be placed at one or more of the personal supply stations, as especially the inner gloves tend to be wet. A winter hat is an absolute must. It should cover your ears too. Some prefer a functional moisture wicking hat while others opt for warmer traditional winter hats. A hat of 100% wool will have both features, but may be itchy. The neck should be covered with a scarf or a neck tube/buff. It’s important that the scarf/buff can be drawn up over the mouth and nose in case of strong winds. However, running with your nose and mouth covered for a longer time will cause condensation and make your face more prone to frostbite. Balaclavas and buffs with air holes for mouth and nose are available, but even these will eventually turn in to an ice mask. If windy and necessary to cover your face make sure you actively remove the ice building up on your cover. A spare scarf/buff at the personal supply station is advisable. Star Wars fans may invest in a ColdAvenger. The use of tape on cheek and nose is not recommended. There’s no evidence that this will prevent frostbites, but it will for sure prevent the medical team from seeing signs of frostbite. Sunglasses or light ski goggles will be a relief in sunny, windy and/or snowy conditions. For choices of shoes and anti-slip soles, please see “Shoes”. Your feet are the least exposed part of your body as you’ll be constantly moving sending a lot of blood to your feet and toes. We do recommend, however, that you wear warm running socks, alternatively with a thin liner sock underneath. Make sure the sock is high so there’s no open skin gap between sock and tights/pants. A spare pair of socks at the personal supply station is advisable. If the ice sheet is covered in a thick layer of snow gaiters will keep it out of your shoes, but cheaper solutions like a plastic bags inside your shoe may do the trick. If you’re prone to blisters the plastic bag may cause too much friction. Half marathon runners and marathon runners staying at the Old Camp should pack a small bag with extra clothes to be available at the finish line. Marathon runners at Hotel Kangerlussuaq and Polar Lodge can walk to their rooms and do not need to prepare a change of clothes. Make sure you mark all your clothes and items with your name and/or bib number for easy identification. Clothes and items dropped at the water stations during the run will be taken back to the finish area at the end of the race. The race organisers cannot be held responsible for any lost or damaged items left along the route. The Polar Circle Marathon can be run in a pair of normal running shoes or trail running shoes. It is, however, mandatory for all runners to wear spikes when running on the ice cap! Spikes (or anti slip soles) is a rubber sole with steel points underneath that can be fitted to your running shoes and ensures a safe grip on ice. There are many different types of anti-slip soles, but some of those that will be approved for this race are: Kahtoola NANO- or MICROspikes, Yaktrax, LACD Snow Spikes and Grivel Ran. Albatros Adventure Marathons will email all confirmed participants with an offer to purchase proper spikes and have these included in your race pack. A medical team is ready in case of injury or severe exhaustion. A doctor will be present on the ice sheet as long as runners are on it. A doctor will be patrolling the route and a doctor will stand by in the finish area. A sweeper will follow behind the last runner throughout the race. On the ice sheet, a snow mobile is on standby in case of accidents or rapid change in weather. A bus will be parked just before the entry/exit to the ice cap, ready to warm up runners if necessary. In case of strong winds all runners will be stopped before entering and after exiting the ice cap and checked for signs of frostbite. Runners who wish to drop out of the marathon should go to the nearest drink station where sleeping bags will be available to keep you warm. Transport to the finish area will be arranged for all runners who leave the race, but please be aware that waiting time may occur. Take extra precaution when running on the ice sheet. Fall injuries on the hard ice could mean your race is over. First degree frostbite signs are sensations of cold and pain and/or the affected skin turning white. First degree frostbite is only a superficial injury and can be treated by anyone, including yourself, simply by warming/thawing up the affected part of your body. If it’s not possible to go inside warm hands can thaw the frostbite, but remember to take off gloves and warm skin to skin. If your fingers are at risk they can be warmed against your stomach or in the armpits. After thawing first degree frostbite the skin will be slightly red and may still feel “buzzy”, but as the blood is now streaming back it takes longer time for the same area to get frostbitten again. Eventually all signs of a first degree frostbite will disappear. Second degree frostbite is deeper and develops blisters. If you have blisters anywhere on your body after finishing the race, don’t assume this is a normal friction blister, but go see the medical team and get the blister examined for being a possible frostbite. Treatment can be rather painful and last for several weeks. Permanent redness on the affected skin may occur as well as the area developing permanent intolerance to coldness. Third degree frostbite is a very deep skin injury causing dead tissue. Instead of extreme white the skin can turn red and purple. A sense of numbness in the area is typical sign of third degree frostbite. Beware, however, that a finger with third degree frostbite can still move, although at reduced function, so don’t let this fool you to believe the injury is less serious. The sooner frostbite is treated the better the chances of a good recovery so don’t ignore any of the signs above. A runner with second or third degree frostbite will not be allowed to continue and/or run the following day if signed up for the Polar Bear Challenge. Frostbite is avoided by dressing well – see the Clothing section for more details. REMEMBER: It's important to avoid dehydration, so make sure you drink at all the water stations! Your skin will have more resistance towards cold when the natural skin grease is intact, so it is recommended not to shower in the morning of the race. As a minimum avoid washing your face with soap. A non-water-based lotion will also give a certain degree of protection if applied a couple of hours before going outside. Keep moving your fingers while you run, clench your fists and make faces every once in a while. If you take daily medicine prescribed by your physician or need any other medication, please inform the race doctors in advance by writing to marathon@albatros-adventure.com. Do not forget to drink water before and during the race. Running in the cold will not make you feel as thirsty as in warmer climates, but the route is still 42.195/21.097 kilometres long! All finishers receive a medal. A small, symbolic prize is awarded to the top three finishers in each race (marathon, half marathon and Polar Bear Challenge) in the male and female categories. Please note that there is no prize money. For information on the route, start and finish lines, drinks stations and other course-related information, look at the course map. The time limit for half marathon is 4 hours. The marathon time limit is 7 hours. Runners still on the route after the time is up will be picked up by a race official or medical car and driven back to the finish area. The Polar Circle Marathon takes place in October every year. In 2019, the event takes place on the 26 and 27 of October. In 2020, the race will take place on 24 and 25 October. To participate in the marathon, runners must be minimum 18 years of age on race day. To participate in the half marathon, runners must be minimum 16 years of age on race day. To participate in the Polar Bear Challenge, runners must be minimum 18 years of age on race day. A team of Danish doctors will be present during inspection and race days. The medical team is ready in case of injury or severe exhaustion. A doctor will be present on the ice sheet as long as runners are on it. A doctor will be patrolling the route and a doctor will stand by in the finish area. If the medical team finds it necessary they can stop a runner and take him/her out of the race. Decisions on taking runners out of the race will only be done if the medical team believes there is a serious health risk in continuing. The medical team can stop a Polar Bear Challenge runner from starting the half marathon if they deem the impact from the marathon has been too hard and poses a health risk for the runner. No refund is given in such cases. Do not forget to drink water before and during the race. Running in the cold will not make you feel as thirsty as in warmer climates, but the route is still 42,195/21,097 kilometres long! All decisions made by the medical team are final and not up for discussion. Runners who wish to drop out of the marathon should go to the nearest drink station where sleeping bags will be available to keep you warm. Transport to the finish area will be arranged for all runners who leave the race, but please be aware there will be a waiting time. Are you as awesome as the Arctic Circle’s biggest predator? We introduced the Polar Bear Challenge for the very fit. Take on the challenge and run Saturday’s marathon and Sunday’s half marathon! Finish both races within the time limits and receive the Polar Bear medal in addition to the half marathon and marathon medals. Finisher photos and other race images will be available after the race. Some race images will also be available in the gallery. A finisher’s certificate will be available for free download from the website of our photo partner www.marathon-photos.com. The race officials reserve the right to change the course and other aspects of the race without advance notice. Please note that all decisions made by the race officials and/or medical team are final. Registration for the Polar Circle Marathon is done in combination with booking the 5-day tour package. Race entry only is not possible. The marathon takes place on uneven gravel road and ice. The run starts about 4km from the ice sheet and follows the gravel road onto the ice sheet itself. While running on the ice sheet one be very attentive and careful, even with a thick layer of snow on top this part can still be very slippery. Due to the enormous powers of nature and the general retraction of the ice sheet, the exact distance on the ice will only be found a couple of days before the race, but a 3km loop is the aim. Because of the danger of falling into a crevasse, it is strictly forbidden to leave the marked route on the ice sheet. Coming back up from the ice and passing the starting point you have approximately 32km left to the finish line in Kangerlussuaq. Please bear in mind that although the road is gravel, it is likely to be covered in a layer of snow. Running these remaining kilometres you will pass enormous glacier tongues and moraine plains and go through tundra and arctic desert. If you are lucky you may also see reindeer and musk oxen grazing along the route. The terrain is hilly all the way with the steepest ascents being the climb coming off the ice sheet and the approximately 75m-high climb 5km before the finish line. From the ice sheet to the finish line, however, the route has an overall descent of approximately 500m. The marathon finish line is located in front of Polar Lodge in the northern part of Kangerlussuaq. The half marathon finish line is located at Long Lake, just before Sanddrift Valley. Please note that the route description is subject to change according to the forces of nature. Do not forget that this is first and foremost an adventure. We are far away from comforts of home and this makes it impossible to offer services at the same level usually provided in city marathons. Kilometre signs will be set up along the entire route. Owing to the conditions, however, they may be placed a few metres from the precise kilometre mark, so use signs for orientation only and don’t calculate your speed based on the signs. On the ice sheet, the route will be marked with poles and flags. Because of the danger of falling into a crevasse, it is strictly forbidden to leave the marked route on the ice sheet. Nordic walking and trekking poles are not allowed. 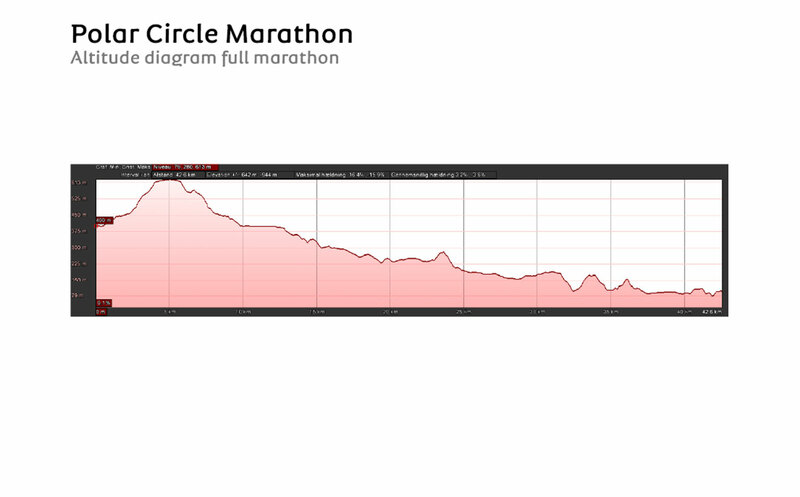 The Polar Circle Marathon & Half Marathon are both scheduled to start at 8:30am. Last-minute changes to the start times may occur. All runners who complete their distance within the time limit will receive a medal. A small, symbolic award will be presented to the top three finishers in each race (marathon, half marathon and Polar Bear Challenge) in the male and female categories. A light meal is available for runners at the finish line. Runners still on the route after the cut off time will be picked up by a race official or medical car and driven back to the finish area. You will receive your start number (also called bib number) in your race pack along with a start number belt. The start number must be placed on the front of your body and be visible at all times during the race. As clothing layers may come on and off, we recommend that you use the start number belt, but safety pins are also available. Polar Bear Challenge runners receive two numbers, one for each day, in case the conditions are too rough on the number sheet. The start numbers are color coded according to the distance you are running. Marathon numbers are black. Half marathon numbers are red. Polar Bear Challenge numbers are white. A timing chip is placed on the back side of all start numbers. Do not bend or fold the start number as this may damage the chip, which will mean that your time is not recorded. There will be water supplies approximately every 5 kilometres. All drink stations serve water (warm) and at selected stations you will also receive warm elder flower cordial. You can bring personal supplies and extra clothes for the race. Personal supply stations will be situated at the 10th, 21st and 30th km mark (10km mark only for the half marathon). Personal supplies must be delivered at the starting area clearly marked with the runner’s bib number and name. There are no toilets along the route - meaning you will find a toilet everywhere… Toilet paper is available at all water stations. Remember that we run in wild and unspoiled nature and cups, empty bottles and other trash should be put in the litter bags at the water stations – please do not litter in nature! Personal supplies (energy gels, food, drinks, clothes, etc.) can be placed at selected drink stations along the route. You will be running on gravel and ice (and snow depending on weather conditions). Please be aware, that even when covered by a thick layer of snow, the ice can be very slippery. The races will be timed by Ultimate Sport Service using BIB-chip. The BIB-chip is attached on the back of the bib number and will record each runners net finishing time. Do not fold or bend the bib number as it could damage the chip. In the evening of each race a complete result list is expected to be ready. There are no age categories. The weather in Greenland is always unpredictable! Expect the temperature to be minus 15-10 degrees Celsius when the marathon is started. As the sun rises the temperature will typically rise to minus 10-5 degrees Celsius. Snow may occur, but Kangerlussuaq is known for its stable and relatively comfortable climate with little precipitation. Wind changes are the unknown factor. Strong winds can generate serious wind chill and are the most common cause of frostbite. To be prepared for the weather, please carefully read the information on Clothing and Safety.